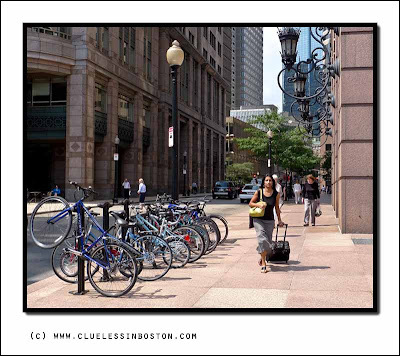 You can see some of the new bicycle racks Boston has installed to encourage bike ridership in the city. Thanks very much for sharing interesting photos and story. I enjoy reading this post. Another sunny day in Boston; think I'm getting jealous. Wow so many! And that girl with suitcase is a great detail! Love the composition of this, the echo of the bike wheels in the lantern supports. And the woman with the wheeled suitcase (which is suggested but not seen) moving toward us. Great shot. Like pedestrian, bikes are coming back in big cities, slowly but surely.A good news! I see this with a bit of envy... Nice composition, perfect to make the point. Seems to be a trend everywhere. The bike racks are wonderful. The lamps are beautiful! And this is a great slice-of-life shot!